I recently took a trip from Salt Lake City, Utah to West Yellowstone, Wyoming. Located halfway in between both is a small town called Idaho Falls, Idaho. We were stopping for the night and we were hungry. We had a hard time finding restaurants that a)were open on a Sunday and b) were open past 8pm. One place that caught our eye is a place called The Bees Knees Pub and Catering Company, located in the FairBridge Inn and Suites just across the Snake River from downtown Idaho Falls. There is nothing flashy or showy about The Bees Kness, it’s just a pub. A bar area with a small dining room. To our surprise, what seemed to be an ordinary pub, ended up being quite a find. 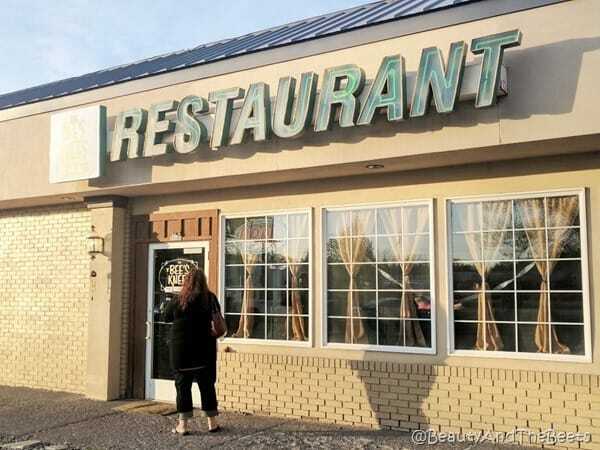 We actually had a great meal. 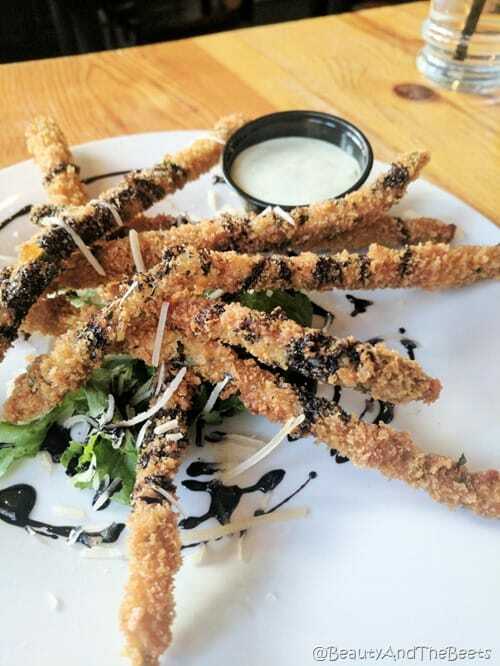 We started with the Panko Asparagus Fries and they were crispy and warm. Asparagus anything is one of my favorite things and this did not disappoint. Mr. Beet and I also split The Prairie Salad- a salad with roasted veggies, on the menu it states “all the veggies we have” and they had a lot of veggies. 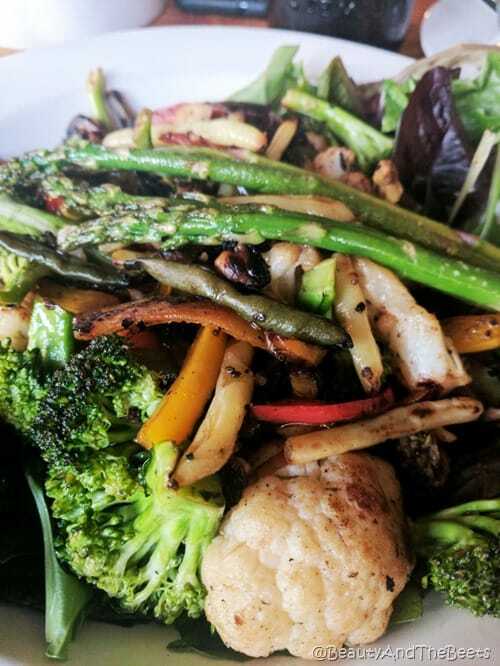 Carrots, asparagus, broccoli, cauliflower, mushrooms, onions, and peppers and they were perfectly roasted. We tried the hot balsamic dressing with the salad, basically a balsamic reduction mixed with butter and some seasoning. It was amazing. 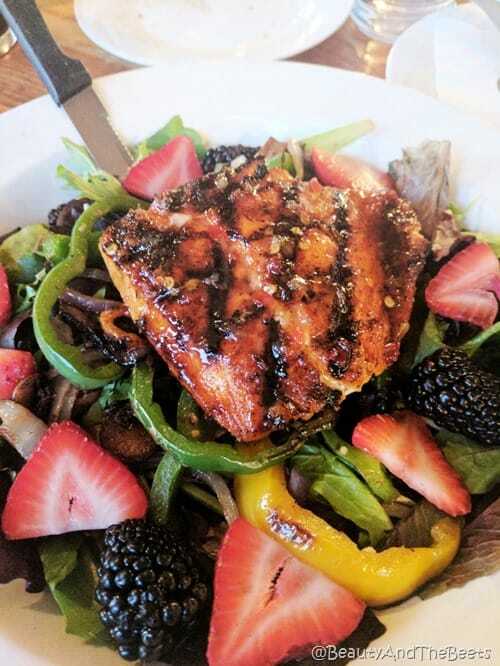 Our travel companion ordered the Shanghai’d Salmon Salad, a mix of greens with fresh carrots and roasted mushrooms, onions, and peppers mixed with fresh seasonal berries. Topped with a generous portion of Atlantic Salmon, it was a perfect light meal. I ordered the French Bread Pizza which is exactly what it sounds like. 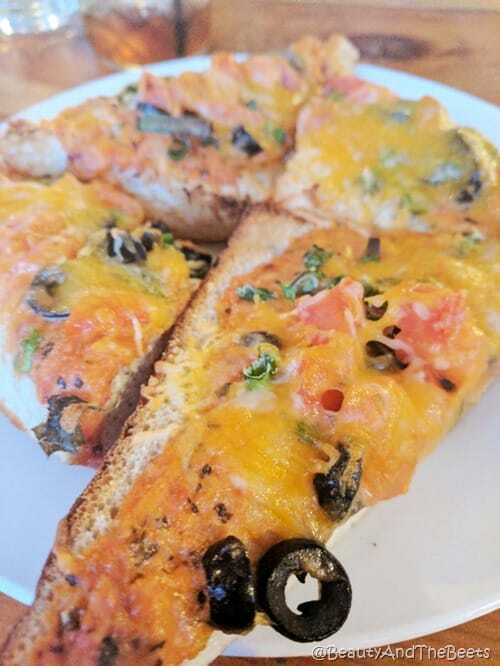 Thickly sliced French bread pizza with a choice of toppings- I went with a veggie mix of black olives, tomatoes, and green onions. Mr. Beet ordered the Pesto Flatbread Pizza. Another dish with “all the veggies we have” on a thin crust spread with pesto. 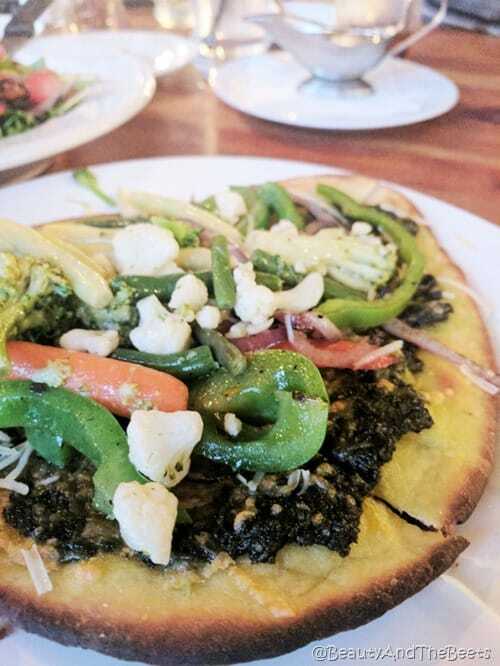 The flatbread was piled so high with veggies it took a knife and fork to eat it. Super hearty and super healthy. The Bees Knees Pub is definitely high on my list of recommendations of restaurants in Idaho Falls, don’t let the plain pub-like atmosphere fool you. 4 1/2 out of 5 sprouts.